Tweet Sometimes you do an interview and get one word to one sentence answers, other times you get in depth and very interesting answers. 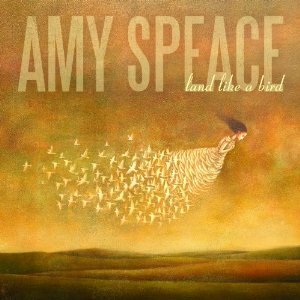 When I did my interview with folk star Amy Speace, I got the latter. Her new album “Land Like a Bird” is a great folk album. You can really feel the emotions that she is trying to get across in her music. Check out my interview with Amy Speace. Zoiks! : After reading your bio, I thought you had a pretty neat experience being discovered by Judy Collins. Can you tell our readers a little bit about that experience? Amy Speace: A few years back (think it was 2004 or 2005), I wanted to go to SXSW in Austin, but didn’t have an official showcase. An Austin friend invited me to come play an unofficial off-site showcase. I think I played 4 songs in a coffee shop. I can’t remember. But this woman approached me and asked me if I had a demo and I gave her a CD of what I’d been recording with producer/guitarist James Mastro in Hoboken (which would later become “Songs For Bright Street”, my 2006 Wildflower release). Turns out, she was Katherine DePaul, Judy Collins’ manager and the president of Wildflower Records and she was in town A&R’ing for the label. She heard something in me that she thought Judy would love, my songs and that my voice was reminiscent of Judy’s. She brought the demo back to NYC and pretty much within a month I was signed to the label. I met Judy soon thereafter by opening for her at a large theater in Minneapolis and she was so kind and really supportive, humming a few of my own songs back to me. Honestly, it was one of those moments that support that notion that you should ‘never turn down a gig’ and that opportunity comes when you least expect it. So there’s a measure of serendipity and being ready for it. Z! : Would you call your most recent album "Land Like a Bird" your most personal album yet? Z! : How would you describe the album, is there a constant theme? AS: Migration—external and internal -- sounds very obvious – and admittedly I’m beating the metaphor to a feathery pulp! (laughs) I left a marriage (and wrote about that stage of my life in my last album, “Killer” and this is the follow up), left my town of 18 years (NYC/NJ), left friends, left family and moved thousands of miles south to Nashville on a kind of well-educated whim. So many of the songs, if they aren’t directly addressing autobiographical elements, they were born out of those moments, and no matter if the “I” in the song is me or another imagined character, there’s always a thread of truth of authorship in the “I”. The songs are about love and lust and loss and grief and what’s real and what’s imagined in love, because that’s what interests me. Z! : How was the writing/creating process different this time around than on your previous efforts? AS: It all happened much faster, in a shorter period of time. I only had a few of the songs for this album when I began conceiving of it with Neilson Hubbard. We started talking about working together in April 2010 and we’d meet at my house in East Nashville and talk about life and music, just getting to know each other, and we’d start writing songs. It came really fluidly. I love writing with Neilson. It was just…well…easy. So after only a month or two we had a body of work to cull from, and then I had the songs I’d written on my own or with others, and by June we’d decided on the songs we were going to record, the ‘theme’ of the record, the players, and we made a plan to do it in 2 weeks in August/September. There were songs Neilson and I wrote that didn’t make it on the record and songs I had brought to the table that were cut because they didn’t really fit. And as we recorded and brought the thing to fruition, and we were finding the sound, it was really clear how we wanted to put it together. For instance, we recorded “Drive All Night” the day after we wrote it—we weren’t even sure if it was a song, or finished, and the drummer, well that was his first take, his first instinct, we caught it and we knew. And immediately we knew that HAD to be the opening track of the record. Similarly, when we wrote and recorded “Real Love Song,” we knew we wanted that as the last song, a kind of coda. I think the process for me has become clearer and I think I’m more aware now of what I know I can do and what I can’t. The first record, “Songs For Bright Street” well, that was really a collection of songs, of demo’s. I was just finding my footing as a writer and I was just putting the band together that would become The Tearjerks. “Killer In Me” – I’d been writing and stockpiling songs as I toured “Bright Street” and street-tested many of the songs on the road with The Tearjerks, so we had a really connected ‘sound’ and Jim and I decided to record out of town, in residence, at Mitch Easter’s studio in North Carolina, to live there and record everything live, all of us in one room, try to get things on the first few takes to get a really organic live sound. We recorded to analog tape as well, so there’s a warmth and an energy in that record, also a weariness to my vocals, because mostly I was recording them at 2am or so, I was tired, it was right after the New Year and I was fighting a cold, which gave me a bit of gravel in my otherwise clear voice. And to be honest, I was in the midst of personal chaos so although I was recording songs about shift and change and questioning, I was also IN that shift and change and questioning and I think you can hear that in my voice. Those 2 Jim Mastro-produced records were about capturing this entity—the band, the vibe, the sound. Not so much about ME as the centerpiece to it. That’s where I was, though, as a musician, part of the whole, writing for those guys, that sound. I’d disbanded that band even before I left for Nashville, and I was writing differently and was ready for a change. I didn’t hear loud rock guitars anymore as I was imagining the arrangements I was thinking more stripped down, quieter, piano and cello, more intimate, more emotional. Z! : What was the moment in which you realized that this was what you wanted to do with your life? AS: I don’t really know to be honest. I went to college at Amherst College. Knew I wanted to study whatever I could, that I had the opportunity to read great books, learn from extraordinary professors and other students who were much smarter and more well-read and more eloquent than I was. I felt like I snuck in the backdoor and ran the risk of being discovered and kicked out. (laughs) I didn’t really think too far in front of me, as I was just so happily immersed in books and discovery. After college, I went to NYC to study acting, because I had an opportunity and was guided there and doors opened, and a night job appeared when I needed it and an apartment appeared when I needed it… And then I worked in theater and banged my head against that door for a few years, half happy, half frustrated, still didn’t feel like I was living in my own skin. And when I had a break up with a boy who was a songwriter and was living on a friend’s couch in the West Village in between apartments, cradling my broken heart, I bought a guitar and started writing, kind of out of the blue. It wasn’t something I had done before. And from there, I dipped my toes into the waters of the NYC open mic scene, then got gigs and got a manager and an agent and then came the time when I was torn between the pursuit of acting and the pursuit of music, I couldn’t do both and do them well, as well as have a support job (I was a secretary and a bartender and Laine Kazan’s personal assistant), and I just followed my heart and went with music, not knowing at all if it would ever work out, but just trusted some internal voice. It wasn’t like I was mapping out my life 10 years ahead. I was literally thinking in 6 month increments. It was all about, ‘can I pay my rent on my East Village apartment? Can I eat out once in a while? Can I pay my student loan? Can I get the gig at The Living Room? And can I do a few tours and make an album?” I never had a plan, which was really hard to live through, but I was watching others, studying others who did this who were a few steps up the ladder from me, I went to a ton of music conferences and sat through all the lectures on DIY and independent music and booking your own tour and making your own records, etc. I ate up that information like I was in a PhD program. I worked for a time at EMI Music Publishing as a temp and then full time for 2 years while playing NYC clubs and doing weekend tours, and learned so much there about the business. What I wanted and what I most certainly didn’t want. And I learned how to read (and write) a contract, which has served me well. At the time, living through those years, I felt like there was no plan I was just floating, but now, looking back, every step of the way has served me well, from going to acting school to running a theater company to booking myself on college tours to working for Laine to working at EMI. So was there one moment? No. But I can point to two moments where I realized I’d kind of landed on my life. The first: I was backstage at the Rocky Mountain Folks Festival, I’d played during the afternoon and Judy Collins was headlining and she’d brought me into her dressing room to hang out and talk. She was doing her own hair and makeup and talking to me about writing her book (a memoir) and that she was having some writer’s block and she asked me what I did when I had writer’s block and I realized I was having an ‘artist to artist’ conversation with this woman who was my idol, not mentor to mentee, but we were just two songwriters hanging out talking. And so I asked her, “what am I doing right? Or wrong? Or…” and I was stammering, totally nervous, “how do I get to be here with longevity like you…?” And she smiled at me and just said, “keep doing exactly what you are doing now and just trust it.” And I realized that was it. I was there whatever there is…but that I wasn’t going to bail on this and go to law school or something after that. The second was when Judy Collins sang my song “Weight of the World” at the Newport Folk Festival’s 50th Anniversary and called it one of the best anti-war songs she’d ever heard. I struggle with insecurity all the time as a writer (who doesn’t?) but hearing that, I felt like, if nothing else happens to me in my career, I can rest easy that I did accomplish something. Z! : Who are your biggest musical influences? Z! : When writing a song, do you need to be inspired, or can you just sit down and hammer something out? Z! : My favorite question to ask established artists is about that moment when a song, or a riff or a lyric comes together. Does that moment still give you chills or goosebumps like it probably did when you wrote your first songs? Does that feeling ever lessen? Z! : When you're performing live, what is you favorite part of the show? Z! : Thanks for taking the time to answer these questions. I really enjoy your album "Land Like a Bird." Is there anything else you'd like to add?